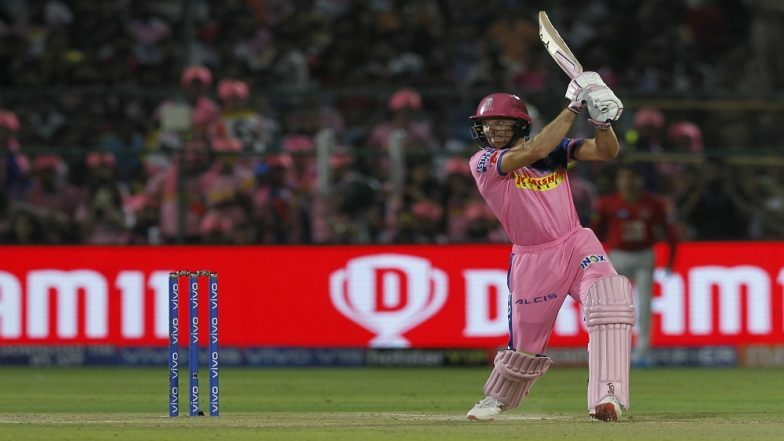 Jaipur, March 25: Rajasthan Royals opener Jos Buttler on Monday became the first victim of 'Mankading' in the history of the Indian Premier League (IPL) when a Kings XI Punjab (KXIP) skipper Ravichandran Ashwin dismissed the batsman in a controversial manner during their IPL match which was played at Sawai Mansingh Stadium. This is the second time Butler was Mankaded in his career. Earlier, in 2014, during a one-day series, Sri Lanka’s Sachithra Senanayake mankaded him. Really not in the spirit of Cricket #ashwin.#butler owned the bowler tonight. But if we talk about that incident, Butler was given warning by Sri Lanka. Senanayake gave him two warnings in the 42nd over before removing the bails in the 44th. Sri Lanka had also claimed that they had raised the issue in the earlier match where Butler hit a century. VIVO IPL 2019, RR vs KXIP: Chris Gayle's 79 Puts Punjab in Drivers Seat. If we talk about today’s IPL Match between Rajasthan Royals and KXIP, Ashwin sparked controversy by mankading Butler. The Incident took place when Rajasthan were 108 for one in 12.4 overs. Butler scored 69 off 43 balls while chasing 185 runs. As expected Buttler seemed furious and had a heated exchange with Ashwin before leaving the field. After Butler’s dismissal, Rajasthan's innings crumbled and managed to score only 170 runs in their quota of 20 overs.